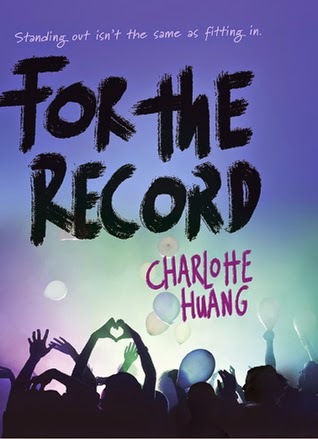 This week for Ask The Author I'm bringing you the amazing Charlotte Huang, author of For the Record which is supposed to hit the shelves November 10th. I've read For the Record back in March and immediately knew I wanted to ask her a couple of questions about it. 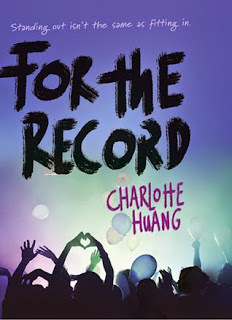 You should definitely mark the release date of For the Record in your calendars because it's a fabulous book worth reading and owning. 2 – What lead to the idea of For the Record? Was it the fact that most of us dream of being the singer of some awesome rock band or something completely different than that? Yes, it was definitely inspired by that universal dream! But I also wanted to show the reality of sacrifice, hard work, grueling schedules, and just overall stress that comes with that level of success. Because my husband’s an agent, I’ve spent a lot of time at concerts, being around bands, listening to the planning, strategizing and anguish that goes on. So my goal in writing this book was to give an authentic, and hopefully entertaining glimpse into the world of a successful touring rock band. 3 – Was there a scene in the book you specifically remember writing because it stuck out to you, either in a positive or negative way? Probably the scene where the band sees their DJ friend’s set in Detroit. That scene actually came during the editing process and I wrote it after I saw Zedd perform at Coachella. Originally, I’d written the scene in a diner but my editor pointed out that I had too many eating scenes so I had to brainstorm other settings. The EDM show atmosphere appealed to me because I feel like that type of music shifts everyone’s perspective a little bit and allows people to let their guard down. 4 – While writing about the life on tour and the music business itself, how helpful was having a music agent husband? Did it help you give For the Record that very real touch? Haha, see #2. But it’s not just my husband—a lot of our friends work in the music business. Many of the details in For the Record come from years of listening to funny stories and talking about work drama. 5 – Of all the possible names for a rock band, why did you decide on Melbourne? I’d written a scene where the original band members talk about a spring break trip they took to Melbourne which is when they formed the band. It got edited out somewhere along the way but I stuck with the name. 6 - How long did it take you from first idea until publishing deal? And how many queries did it take until you found 'the one'? I started writing this book in the summer of 2013 and my agent sold it in February 2014. But that’s fairly misleading because this story has been percolating in my brain for years. Do you mean queries to agents? My guess is I sent out about 25 before entering a pitch contest and connecting with my wonderful agent. That was with a different book though. 7 – How do you feel about the fact that in a couple of months, thousands upon thousands of people will be able to read your book? I feel excited! Also nervous. But mostly excited. 8 – Did you listen to specific bands or albums while writing For the Record or do you rather prefer writing silence? For the most part, I actually prefer to write in silence. Sometimes when I try to write to music, I get really frazzled and can’t figure out what’s bothering me until I realize that I have to turn the music off. That said, when writing this book, I listened to Panic! At the Disco’s Too Rare to Live, Too Weird to Die! album on repeat, for hours at a time. I have no idea why this was an exception. If I had to guess I’d say that in addition to being a great album, the mood fits perfectly with what I was trying to write. I was never tempted to skip any track. That’s not a common occurrence. 9 – What was the first band you ever saw live and what’s your favorite band? The first band I ever saw live was Echo and the Bunnymen in Boston. Sadly, I don’t remember anything about the show. And I really don’t have a favorite band! I like so many. People ask what I like to see outside of my husband’s work and most recently I’ve gone to The Foo Fighters, The Pixies and My Morning Jacket. 10 – Music genre: Grunge or Punk? Do I have to choose? If so, grunge was probably a more legitimate part of my experience growing up. I feel like I witnessed the beginning and end of that era. From District 12, definitely fight. I don’t think I’d know any other way.